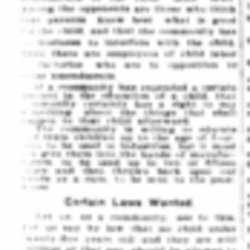 Addams argues that the proposed apprenticeship system needs to be remodeled before it will be effective. 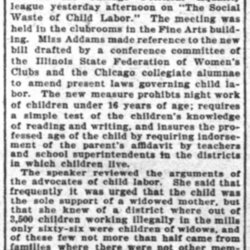 Newspaper coverage of Addam's November 19 address to the Chicago Business Woman's Club linking child labor to laziness in adults. 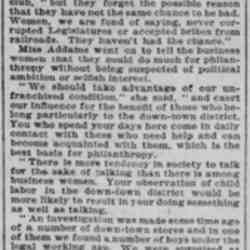 Addams addresses the Chicago Business Women's Club on factors that may cause children to grow into "tramps." 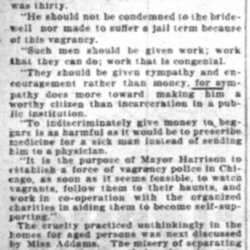 Addams discusses the settlement house's role as a charity and the means by which it appeals to the poor. 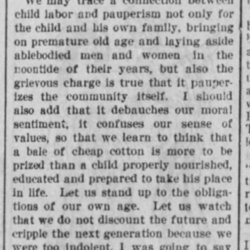 She spoke at the Decatur Chautauqua. 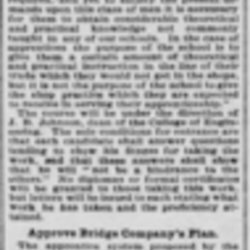 Addams exhorts members of the Chicago Political Equality League to work against child labor and towards educating the poor. 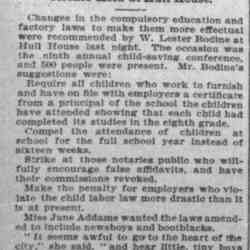 Addams discussed the ills of child labor at a meeting of interested people in Chicago. 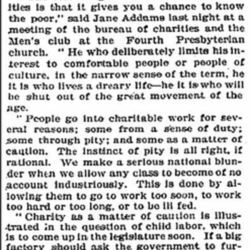 Addams holds that charitable work enables a better understanding of the poor, at a meeting of the Illinois Board of Charities and the Men's Club of the Fourth Presbyterian Church. 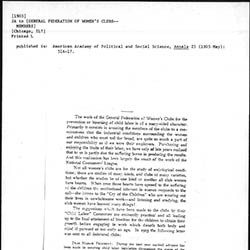 Addams proposes changes to the child labor and compulsory education laws for endorsement to the League of Cook County Women's Clubs. 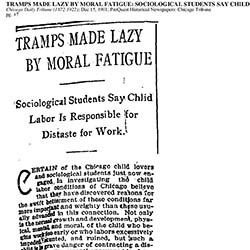 Addams discusses the problems of child labor in relation to compulsory education. 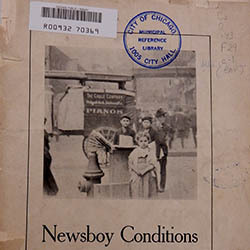 A 28-page illustrated pamphlet outlining the work and social conditions of newsboys and newsgirls, based on a two-day intensive investigation. 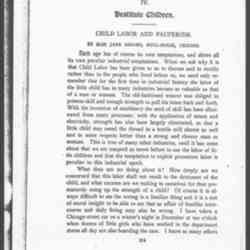 In it the Committee proposes revisions in child labor laws to curb the worst excesses. 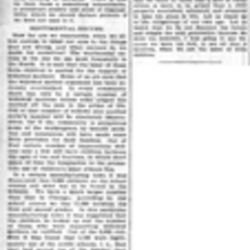 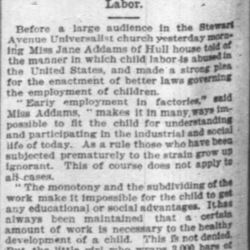 Newspaper summary of Addams' speech on child labor and the need for new laws. 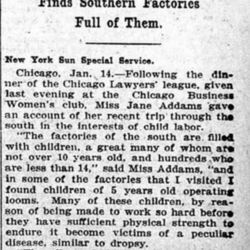 Newspaper summary of Addams' talk describing child labor in the Southern factories. 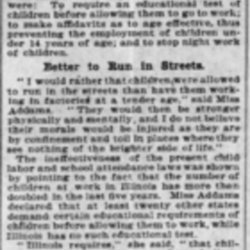 Gompers thanks Addams for writing an article on child labor to be published in the American Federationist. 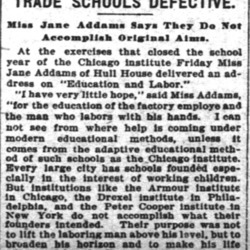 Addams describes the plight of child labor and education in Chicago, especially in the case of immigrants. 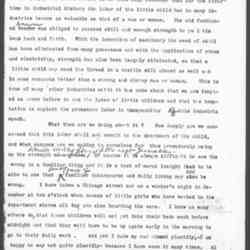 Addams' draft speech, on child labor and education, given at the National Conference of Charities and Correction, in Atlanta. 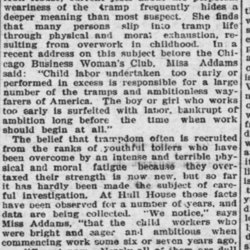 An excerpt of the talk given by Addams at the National Conference of Charities and Correction of 1903 on the effects of child labor. 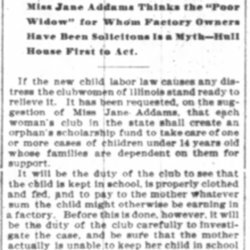 Newspaper account of Addams' statement on raising of women's clubs funds to support child care for widows attending school. 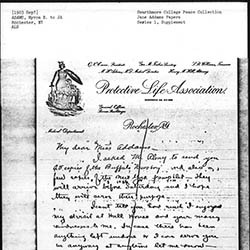 Myron E. Adams to Jane Addams, September 1903? 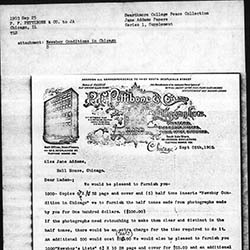 Adams remarks on his pleasant stay at Hull-House and reports that he asked Almy to send Addams the Newsboy pamphlets from Buffalo and New York (not found). 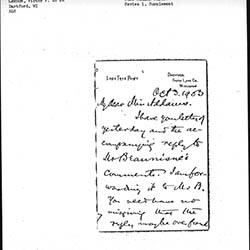 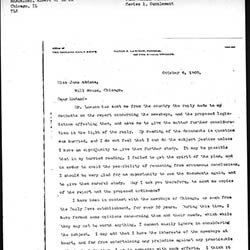 Lawson responds to Addams letter about Albert G. Beaunisne's reaction to the newsboy legislation and encourages her to provide documentation to Beaunisne. 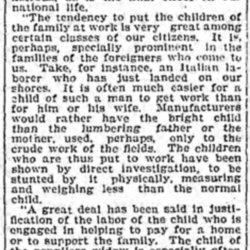 An excerpt from Newer Ideals of Peace, Addams recounts some of the ways child labor has ruined the future of those children exposed to it. 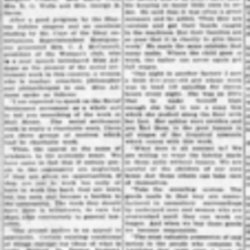 Beaunisne acknowledges seeing the proposed newsboy legislation and admits that he responded quickly and requests the report and proposed ordinance again so that he can give them more careful study. 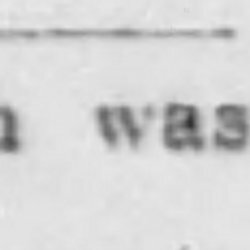 He reports long experience with newsboys and claims sympathy with their condition. 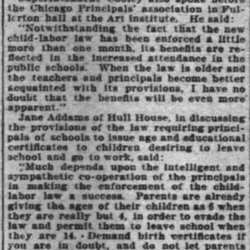 Addams addresses Chicago principals about enforcing the child labor law. 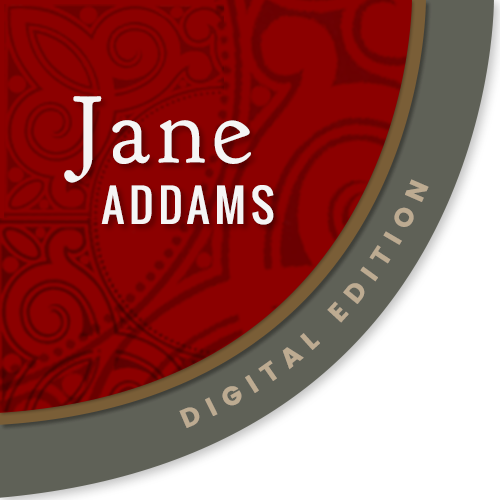 Addams speaks to the Catholic Women's League about the ways the poor are harmed by unthinking charitable efforts. 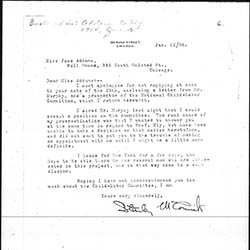 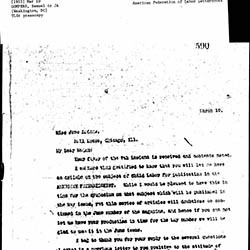 McCormick agrees to join the National Child-Labor Committee and explains that he has not made a decision yet about Richard T. Ely's request.